Carnival revelers can enjoy carnival without losing their dignity. Gabriel Malzaire, bishop of the Diocese of Roseau and President of the Dominica Christian Council said in this year's pre-carnival message that "having fun and enjoyment is not contrary to the gospel" but there are certain standards that Christians must maintain. 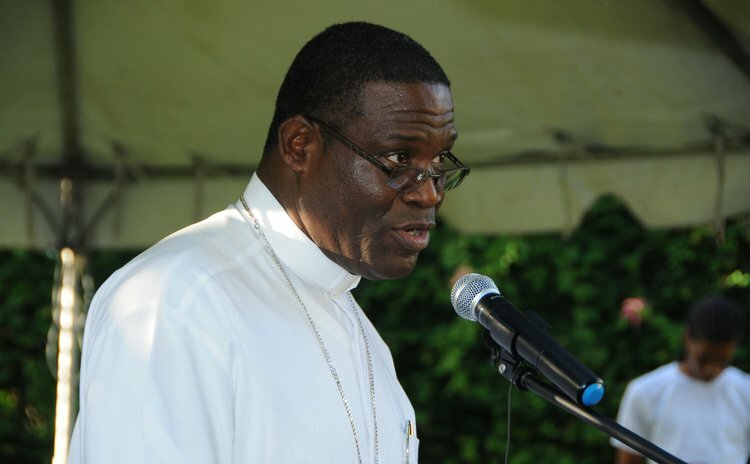 "Carnival should never be used as an excuse to lower one's human dignity," Bishop Malzaire said. "It should never be used as a time for people to settle their differences through violent means or any form of bad behaviour. It should never be used as an excuse for our people to display all forms of indecency and excessive exposure. St. Paul reminds us in 1Cor 6:19 that the human body is the temple of the Holy Spirit"
Dominicans are gearing up for the traditional pre-Lenten carnival highlighted by two days of street jump-up on Monday and Tuesday next week. And although the hours of revelry has been severely limited by Hurricane Maria. Tonight at the New Town Savanah calypsonians clash in a major open air competition to determine who will be Dominica's Calypso Monarch. This is by far carnival's major show, a time Malzaire describes as "a time which unleashes the most creative spirit of our people, expressed in the Calypso art from, talent competitions such as the Queen shows and the beautiful costumes". The Queen Show, at which the Miss Dominica winner is crowned, is absent this year because of the hurricane. But Bishop Malzaire believes that Carnival, traditionally linked to the Catholic Church practice of Lent, should not be used to display excesses. "Carnival should never be used as an excuse to lower one's human dignity," Malzaire wrote in the message. "It should never be used as a time for people to settle their differences through violent means or any form of bad behaviour. It should never be used as an excuse for our people to display all forms of indecency and excessive exposure. St. Paul reminds us in 1Cor 6:19 that the human body is the temple of the Holy Spirit. Malzaire appealed to Christians during this Carnival season to have an enjoyable Carnival but also have "utmost respect for yourself and for others". "I appeal to all parents of young children; keep a close watch over these little ones. To the youth; in the midst of having a good time, refrain from the excessive consumption of alcohol and a complete avoidance of the use of illegal drugs. These reduce your inhibition and can facilitate engagement in unsavory actions and promiscuous sexual activities. While little is spoken of HIV-AIDS today, it still remains a reality," Malzaire said.